You might be thinking “What kind of car (or cars) does this person have?” A whole site devoted to only early Plymouths. Pretty weird. 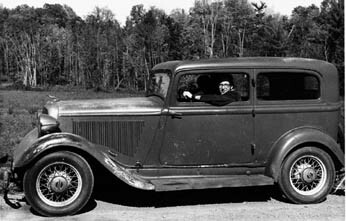 Well, it is a 1933 Plymouth model PD two door sedan. no heat came out of the heater. The seller neglected to mention the rust damage that started under the driver side door, went behind the rear fenders, across the back and ended up only slightly behind the passenger side door. The floor was only really connected to the body at the front half. 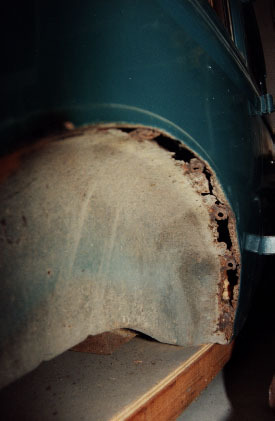 Having been raised in Arizona, I had no idea of how to look for hidden rust damage. For all that the body did not look too bad: No collision damage and the rust was only visible from inside or under the car. The seller also neglected to mention that it leaked about a quart of oil every 50 miles. Or that the brakes provided some sound effects but no decrease in speed. But both of these items quickly became obvious. And at least the brakes were easily dealt with. New shoes, wheel cylinder rebuilds and bleeding the system brought stopping into the realm of possibility. The after market Hadees heater (available when the car was new) failed to put out heat because the engine water pump impeller had long since sheared a pin and was spinning freely on its shaft. By the polished wear pattern, it looked like it had been that way for a long time. The engine had been cooling itself by reverting to a turn of the century thermo-syphon system! That must also have been the reason the thermostat had been removed. The rough idle was caused by exhaust valves burned so badly that three of the six cylinders had no compression. Possibly burnt because of over heating caused by no water pump? Who knows. “Shade tree mechanic” overhaul the engine. On the move west everything worked. But everything was obviously in need of a real going over. Loose steering, rattles, shocks, etc. 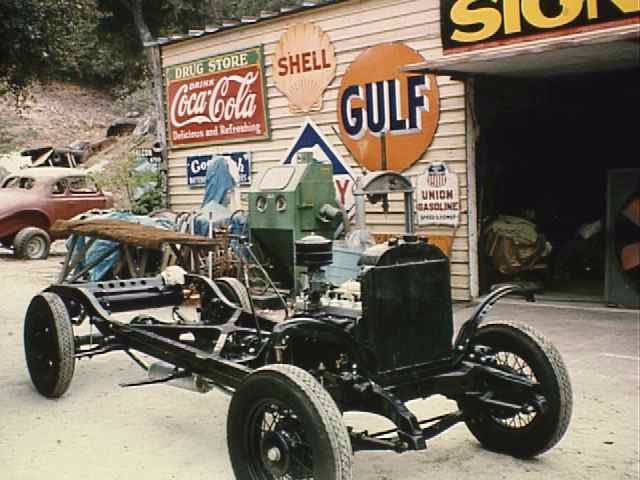 I decided that once I got settled and got a house with a garage I would do a real frame off restoration and make it all perfect. The biggest mistake of my life. I bought a house in the fall of 1978 and built a shop into the garage. 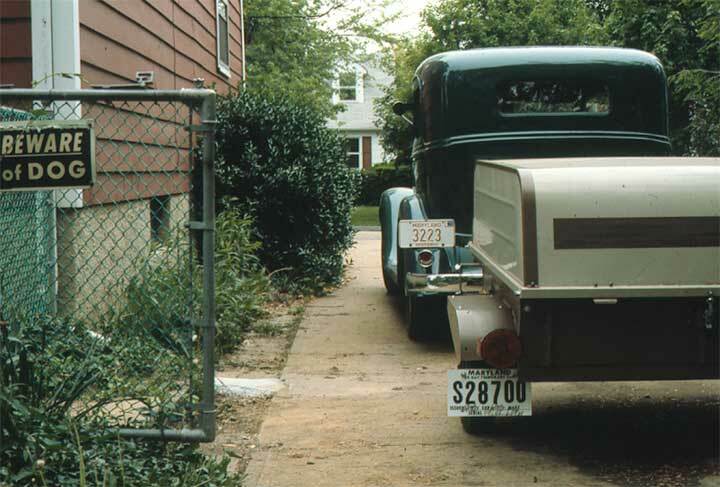 At that point I had driven the old car about 40 thousand miles, a little under 10 thousand miles a year. 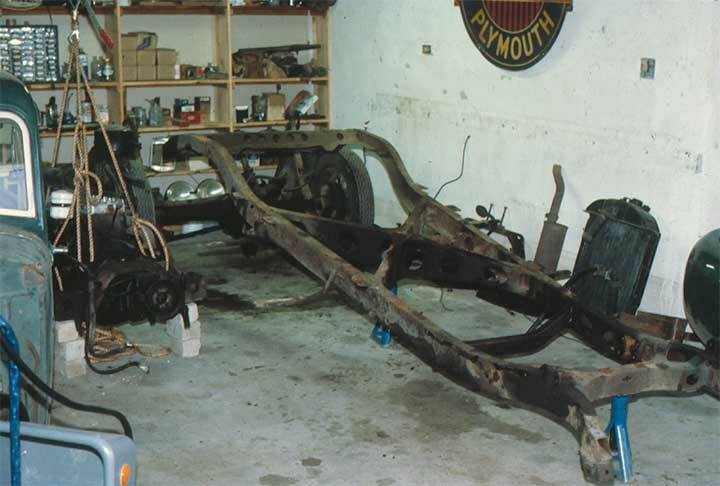 Then the big mistake: I disassembled the car. All the way down. Fenders off. Interior out. Body off. Engine out. Axles off. I ended up with a bare frame and a really cramped and dirty garage. Then I found that, for me, walking into the garage was too intimidating. The amount of work that was visibly needed was overwhelming. The result is that there were years when literally no work was done on the car. I will never take a car all the way apart again. Others seem to be able to do it and get everything back together in a reasonable amount of time. I can't. I am able to take components or subsystems off, repair them and get them back on. Easy things like transmissions, axles, brakes, wiring harnesses, engines. Stick to one system at a time. Get it off, fixed and back on. Get the car running again before starting the next item. Then I am okay. Just not everything at once. It is just too overwhelming. Despite this psychological disability the mechanical work eventually got done. Frame repaired where someone had taken a cutting torch to a spring hanger. Then was stripped and painted. A while later the front axle was cleaned up and new king pins fitted. A another long time the rear axle was cleaned up, fitted with new bearings and seals. The differential itself turned out to be in good condition and still within factory adjustment tolerances. Then I moved to a new house. This one with a three car garage. But of course the house needed some remodeling and the garage needed a good shop area. Eventually got around to the old car and got the springs reworked. Later the brakes with all the associated backing plates. Then the wheels and some new tires. Finally the frame could roll on its own again! Yet again a long time later I got the engine work completed. Time for another move into a new house. Now I got the transmission rebuilt. Time for the body work. I needed to reverse the ravages of the rust worm. 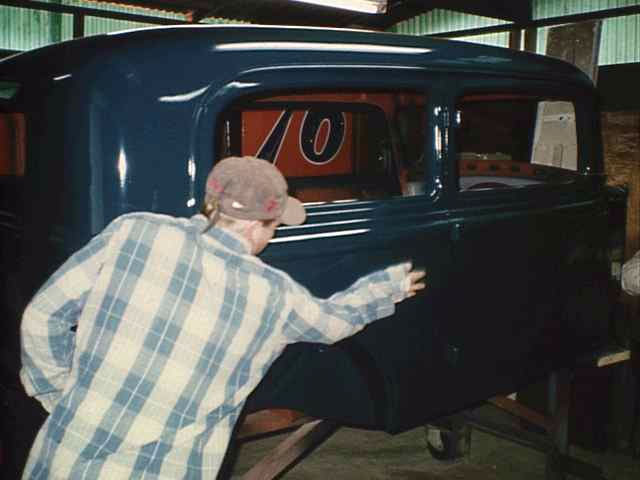 I would need lots of practice to get good enough to do the kind of job I wanted on the old car. I never would get that practice because I did not have the desire to work on other cars. So I was in a quandary as to what to do on the body. Finally a bonus from work set the direction: Use unexpected, unbudgeted cash, to pay for the body work. I found a street rodder who did excellent body work and was willing to work on the job when I had money and let it sit when I didn't (and store the body for me during those times). It was time to start paying for outside work on the car. Over the course of a couple of years the body work got done. All the rust was cut out and new metal welded in. Finally the body and the frame were reunited. And there things sat. All I needed hoses, tubing, wiring, glass, a roof insert, lots of rubber parts, and time to get it running. Of course it sat for a bit longer. During all those years I maintained registration on the car. But I had dropped the liability insurance. My theory was if it wasn't on the road I did not really need it. After all how could I be liable for hitting anything with it if I could not drive it? In 1997 California started requiring proof of insurance to renew registration. Now I did not mind paying a token fee every year to register a non-running car, but I did not like the idea of insuring a non-running car. So either I drop the registration or I get the car running. I opted for getting the car running. 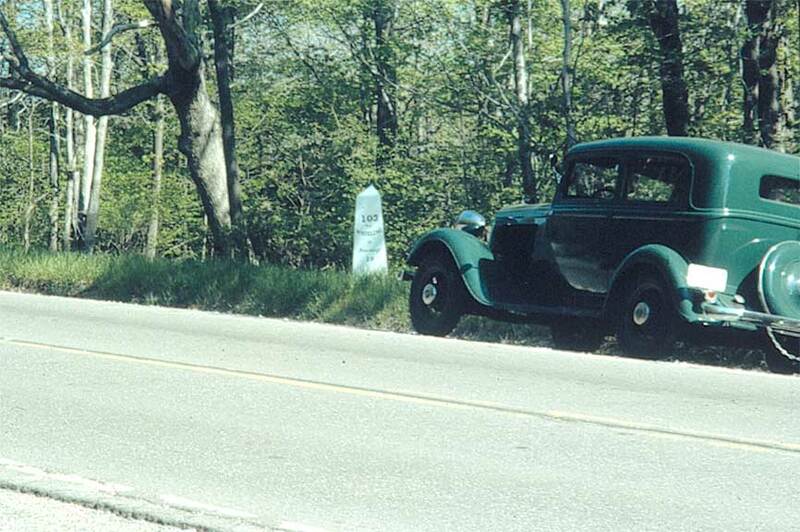 In the fall of 1997 I insured the car when the registration became due. On New Year's Day 1998 I got it to run for the first time in nearly twenty years. During the fall of 1997 and spring of 1998 the company I was working for was experiencing huge problems and it looked like it was not going to survive. So I started looking around and found a “dream” job. 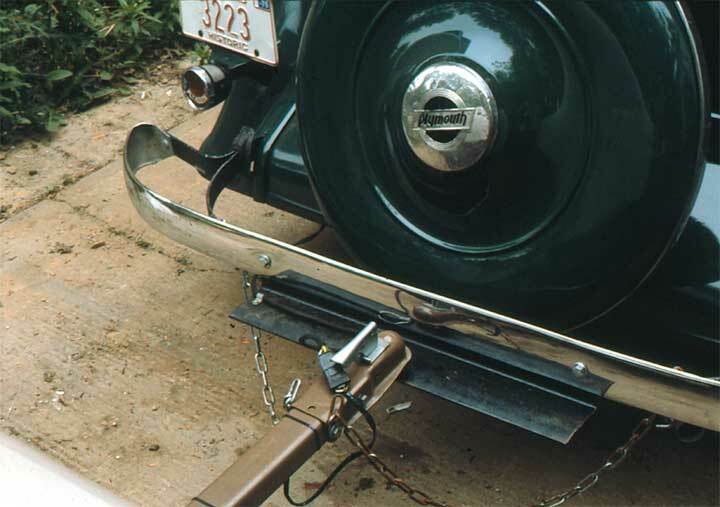 Only hitch: It was located nearly 400 miles from my house. Well, I took the job and made the move. 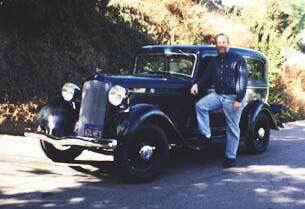 I drove the 1933 Plymouth into Los Angeles County in 1978. It arrived under its own power. I wanted it to have the dignity of leaving L.A. under its own power. So when we sold the old house in December of 1998 I drove it the 380 miles to Silicon Valley where we had just purchased a home. Here is a picture of me and the car a day or so before I drove it out of Los Angeles. We are now in a “new” house and have been fixing it up. Yet another garage/shop is now complete and I actually got an interior installed recently. Sometime I will probably get around to the rest of the trim items. In the meantime, it gets driven on club tours. 2016: Life moves on and now that I’ve retired, we’ve moved on to a beach town with a house that the previous owner did a fantastic job of remodeling. Fantastic, that is, other than the garage. For more, see the garage saga.